‘Accolade’ is a large, grey-green plant which can be regarded as stemless or at most very slow stemming (which means that it may have a very short and compact stem after many years). 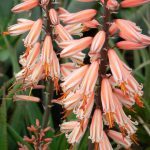 It has earned its place in the Sunbird Aloes line-up because of its beautiful reddish-pink to ivory white flower display in midwinter. 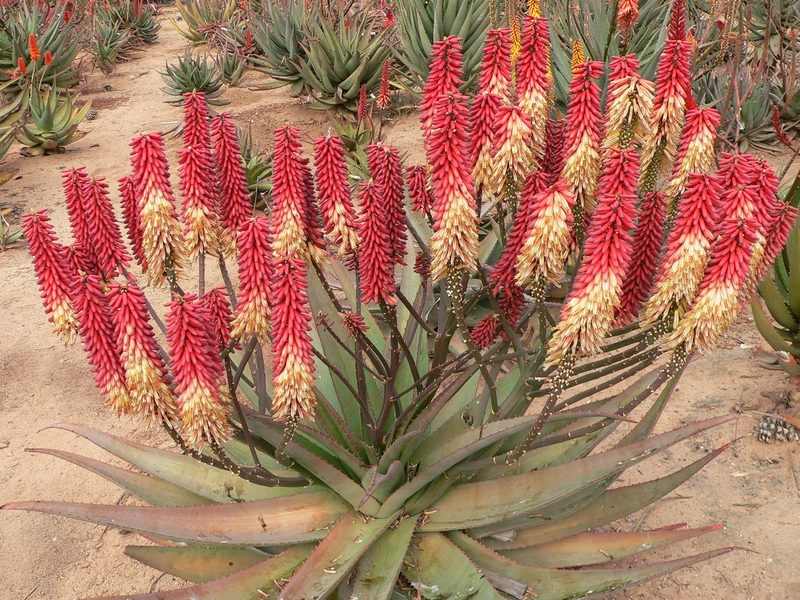 The profusion of semi-upright racemes are carried on multiple inflorescences that create a memorable sight when in full flower during the midwinter months. It is a plant for the open rockery rather than a container. Open area planting will allow for the roots to develop freely. This, in turn, will ensure a flowering performance that will increase for many seasons. The plant itself does not produce stem shoots and is reluctant to divide its rosette. The latter could happen as the plant nears maturity though. Care tip: Because of the plant’s shape the drying flowers that drop from the inflorescences should be removed from the center of the plant to prevent them from attracting fungal growth and/or hiding insect activity. I scrape them out with a stick as soon as there are no more open flowers, but a mechanical blower can considerably simplify the task. 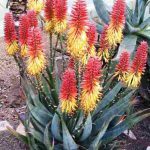 I do not recommend using water for this as your aloes are best kept dry while there is a possibility of cold and frost. In winter water tends to sit in the center of the plant for a long time. 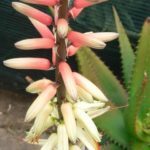 Cleaning out old flowers is a sound maintenance activity for all aloe hybrids. Best recorded flowering performance: 5 inflorescences with a total of 47 racemes spread over the entire width of the plant.